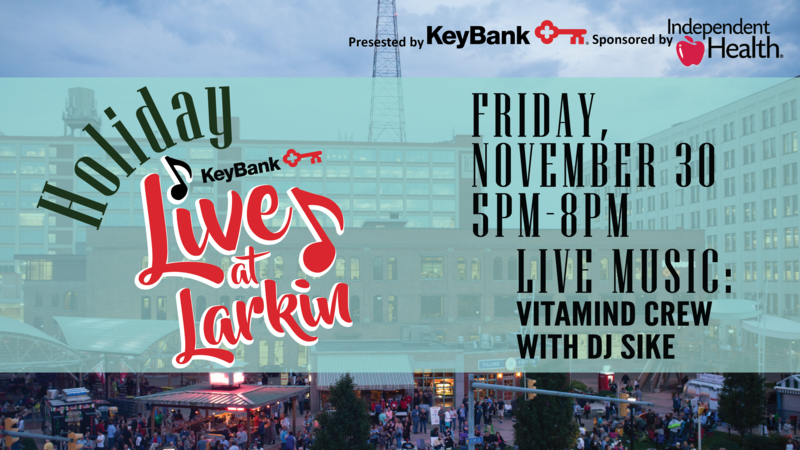 Larkin Square along with KeyBank & Independent Health present the 7th annual Holiday Live at Larkin on November 30th from 5 – 8pm. Kick off the holiday season with this free event featuring live music by Vin Derosa’s VITAMIND Crew with DJ Spike, tree lighting in the square, curated holiday vendor market in the Filling Station, specialty hot beverages, Alpacas from Thistle Creek Alpacas, food trucks, and more! 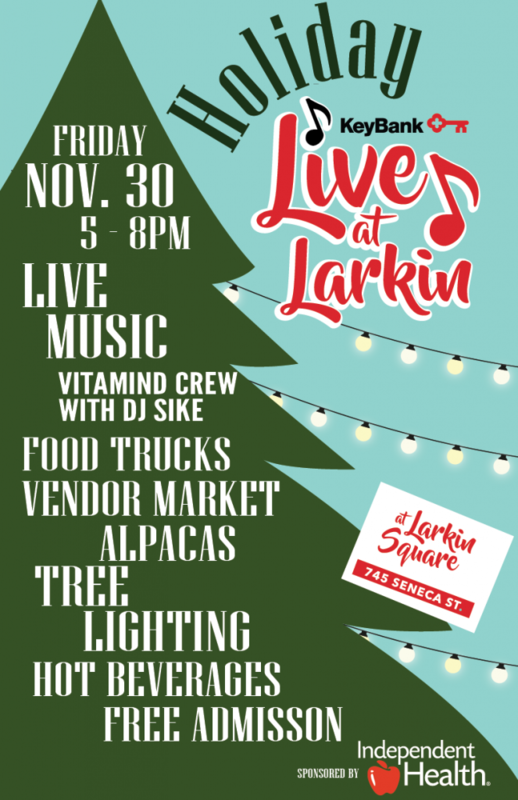 The Larkin Square team has a special deal for guests: receive a free hot chocolate for every canned or nonperishable food item brought to Holiday Live! All food will be donated to the Food Bank of WNY during this holiday season. 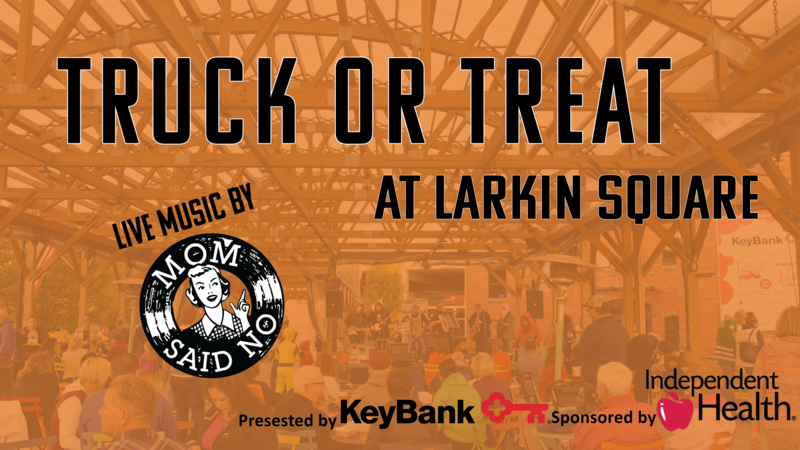 Larkin Square’s annual Halloween bash is back! 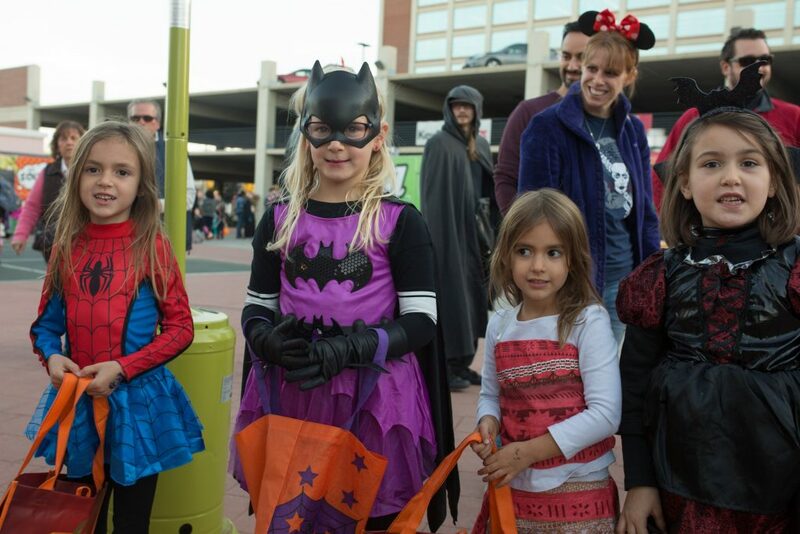 Presented by KeyBank and sponsored by Independent Health, Truck or Treat kicks off the spookiest weekend in WNY with dozens of food trucks, trick or treating for kids, plus live music by Mom Said No.! The event is free and runs from 4:30pm – 8pm. 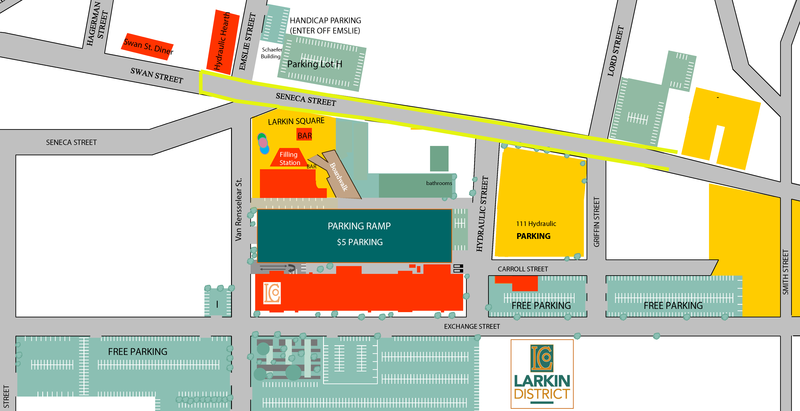 Free parking is available in the lots along Exchange St. and in the gravel lot on Hydraulic St. Costumes are encouraged, hungry appetites are a must. Beer and drink specials soon to be announced! 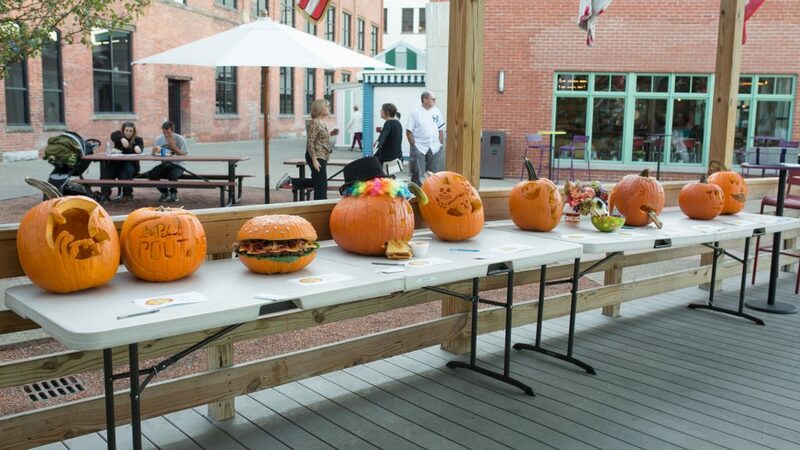 The Food Truck Pumpkin Carving Contest is Back! Participating food trucks will be tasked with carving the perfect pumpkin that YOU get to judge. The winning pumpkin will get bragging rights and a special prize. The Larkin Square author and speaker series is pleased to welcome Buffalo and Hydraulics native, Tom Dudzick, back home to speak with his long time friend Mike Randall. Tom Dudzick was born and raised in the Larkinville neighborhood above his father’s tavern on Seneca Street, Big Joe’s. Big Joe’s and his many memories of growing up in the neighborhood inspired his Over the Tavern series of plays as well as his play Miracle on South Division Street. Tom is in town preparing for the premiere of his new musical, Christmas Over the Tavern. The world premiere at MusicalFare Theatre will be on stage Novemeber 14th – December 16th, 2018. The musical features an all-new holiday story about Buffalo’s favorite family, the Pazinskis, from his Over the Tavern series. “Christmas 1959 is not very merry for the Pazinskis. Dad is going through a mid-life depression and refuses to buy a Christmas tree. Sister Clarissa is threatening to expel 12-year-old Rudy for performing a blasphemous one-man Nativity Scene where he plays all the characters as Hollywood celebrities and everyone is worried that this may be their last Christmas together as a whole family. 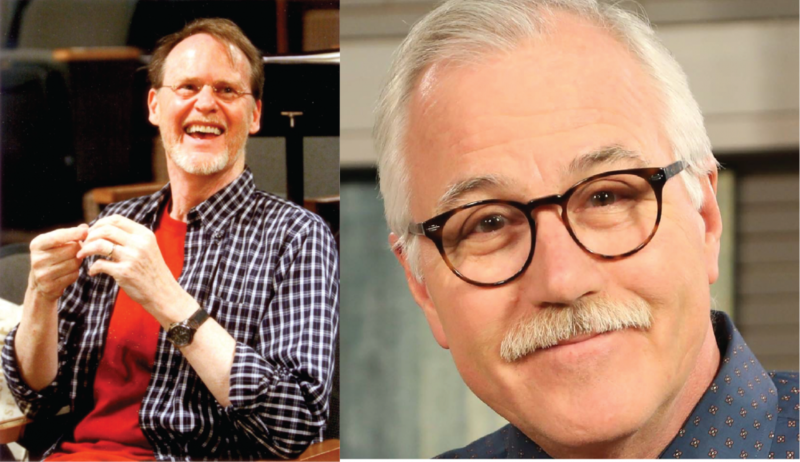 It’s a brand new chapter in this WNY tradition,” shares notes from MusicalFare Theatre. Mike Randall is well known as the chief meteorologist at WKBW channel 7 Eyewitness News. He recently celebrated his 35th anniversary with the station. A native of Western New York, Mike is also a professional actor, puppet master and magician. He has performed a variety of roles in theaters locally and around the country and he continues to perform his critically acclaimed solo shows of Mark Twain Live! and Charles Dickens Presents: A Christmas Carol. Tom and Mike are long time friends dating back to performing together in dinner theater in Buffalo. They look forward to sharing a preview song from Christmas Over the Tavern as well as their memories of acting together. They will welcome questions from the audience as well. During the event, Larkin Square is pleased to introduce the new book from Arcadia Publishing Images of America Series: The Larkin Company. Written by Shane Stephenson with an introduction by Howard Zemsky. 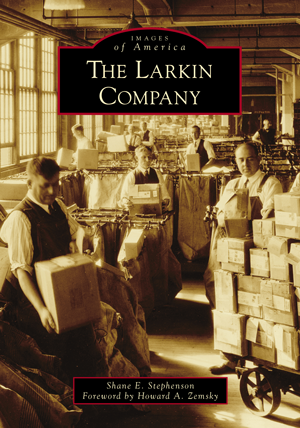 The book is filled with historic photos and the history of the Larkin Company and the neighborhood. Books will be available for purchase, and book signing. The Larkin Square Author and Speaker Series is made possible by presenting sponsor KeyBank and sponsor Independent Health. The Filling Station will have snacks and refreshments available for purchase at the event. 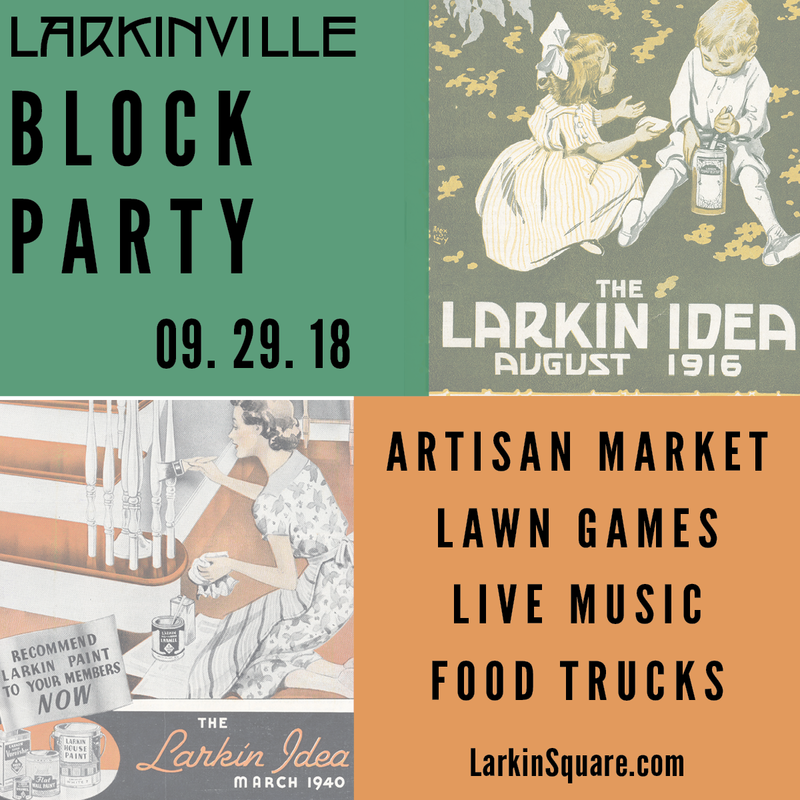 to speak in Larkin Square on Monday, August 20th at 5:30 p.m. Bovino will be joined by Buffalo News food writer Andrew Galarneau for a conversation about food in Buffalo. During the past couple of years, Bovino has traveled and tasted food served throughout Buffalo. He discovered such an abundance of delicious food that Buffalo Everything is the first of two books to be published by Countryman Press. 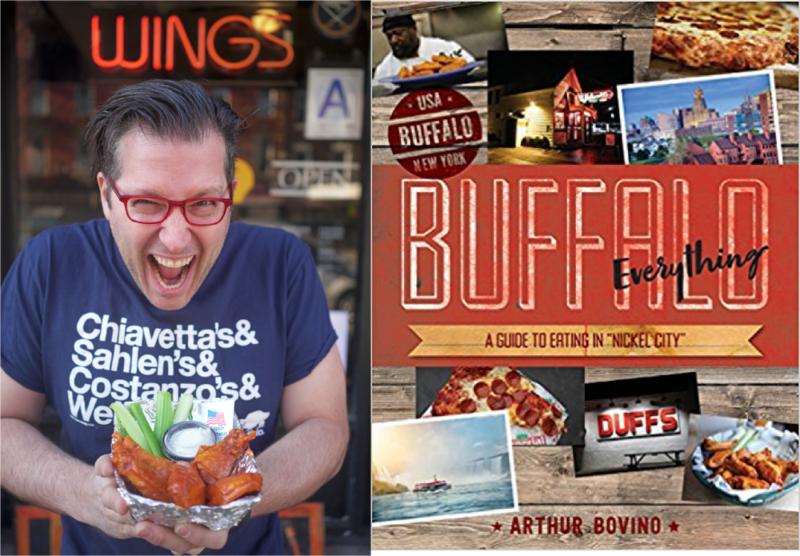 Buffalo Everything is about the city’s dining scene and history, to be followed in February 2019 by a cookbook focused on iconic local foods and Buffalo sauce-flavored comfort foods and party dishes. Andrew Galarneau is the food editor for the Buffalo News and writes frequently about Buffalo area restaurants and other local food related news. Books will be available for purchase at the event courtesy of Talking Leaves Books. Book signing to follow the talk. Refreshments will be available for purchase from the Filling Station. 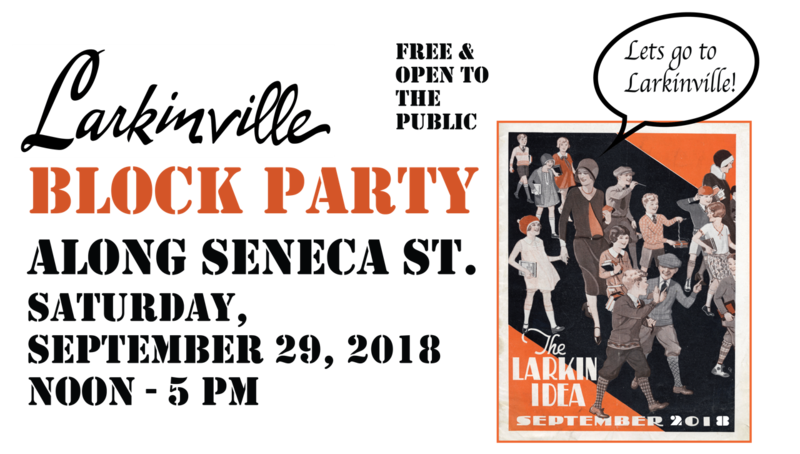 Larkin Square Author talks are presented by KeyBank and sponsored by Independent Health.